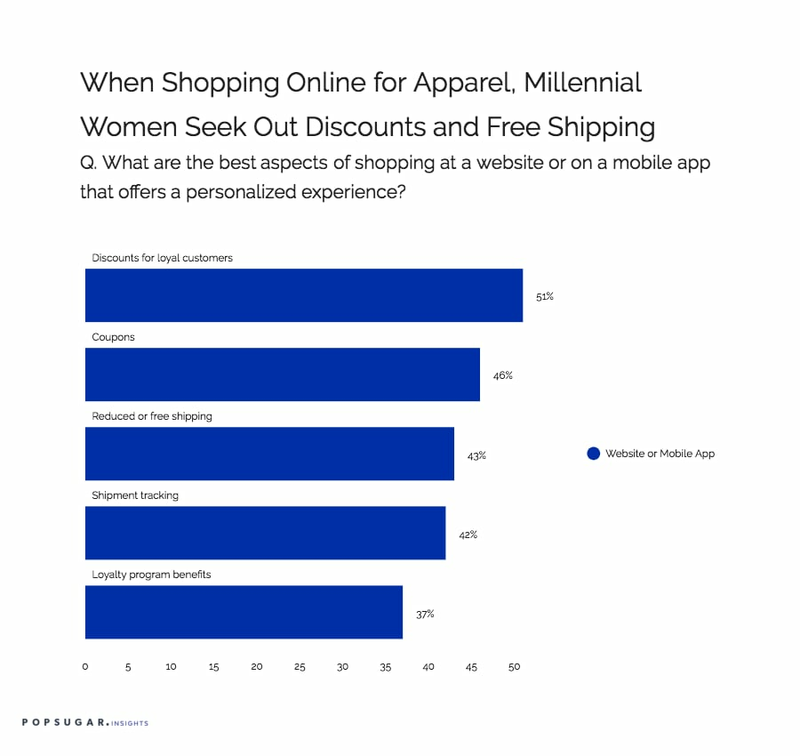 Millennial female apparel shoppers have the entire world at their fingertips, with the ability to shop and purchase apparel and accessories from a number of different touch points across various offline and online channels. As part of the POPSUGAR Future of Retail Experiences study, we wanted to dive into the benefits of each channel and truly understand what millennial women consider to be the best aspects of shopping online and at a physical store location. In terms of in-store shopping, millennial women say that the best aspects of the experience include the ability to have hands-on interaction with products (46%) to physically touch the products, try them on in the store, and know how the product feels and fits before purchasing. Over 40% of millennial women say that the in-store experience provides them with better customer service than other channels, and 42% say that the ability to obtain reduced or free shipping for any products that might not be currently in store stock is a benefit. Over one third of women are excited by the ability of stores to offer in-store services and experiences, including free samples and coupons. Interestingly, millennial women are 16% more likely to care about better customer service than women between the ages of 18-49. Online, women say that the best aspects of shopping on a website or on a mobile application are discounts for loyal customers (51%), coupons (46%), the opportunity to obtain reduced or free shipping on their purchases (43%), the ability to track their shipments (42%), and obtaining benefits from a loyalty program (37%). Over one third of women enjoy having the ability to return products with no hassle or restocking fee and 33% of women enjoy obtaining recommendations based on their past shopping experiences. Multichannel retailers have an opportunity to learn from these findings to tailor an in-store and offline shopping experience for millennial shoppers that offers many of these benefits and resources to provide a heightened shopping experience, regardless of the channel, which will increase shopper affinity.